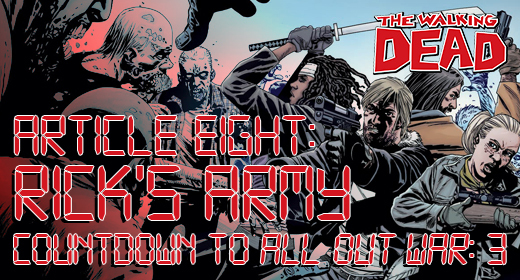 The end is in sight; here’s Article Eight of our Walking Dead Countdown to All Out War. Welcome to day eight of the JustUs Geeks War Report countdown to All Out War. With just a few days left until we can get our hands on issue 115, the anticipation is reaching a fever pitch. All Out War could easily be the biggest story in The Walking Dead yet, and what good is an awesome story without an awesome cast. Today we are going to be covering the characters that compose Rick’s army. Ever since their first encounter in issue 100, Rick has slowly been bringing together his forces to eventually face Negan. With an army composing of members from the Safe-Zone, the Kingdom and the Hilltop, Rick hopes that he can end Negan’s reign of terror in the DC area. While it would be impossible to discuss every single member of Rick’s army, I do want to touch on the key players and why they are important in the war. Andrea has been with Rick longer than anyone else that is part of the army. She has fought along side him as far back as the Atlanta camp, and her ability in battle has never been questioned. Even when she and Dale abandoned the prison during the build up to the Governor’s attack, she proved her loyalty by returning in defense of Rick and the group. She is an expert marksmen who rarely misses a shot, and she does not hesitate to pull the trigger. Along with her ability with a gun, she is willing to obey Rick’s orders, usually without question. Her loyalty and battle proven ability makes her one of Rick’s must trusted lieutenants. Michonne joined with Rick’s group shortly after their arrival at the prison, but since she has been a valuable member of the group. He ability in close combat is nearly unparalleled, with Jesus being the only person who has truly over powered her. She has spent most of her time since the prison close at Rick’s side, and Rick’s trust in her is unquestioning. Michonne is Rick’s go-to in almost any situation. Like Andrea, she is one of Rick’s most trusted lieutenants, and would be hard to imagine that Rick would not utilize her abilities in the upcoming conflict. Heath is one of the newer members of Rick’s inner circle, but he has proved most useful since his introduction. With Glenn’s death in issue 100, Heath has taken the spot as the best scout and tactical mover in Rick’s group. He has proved his worth over and over again for the Safe-Zone with his supply runs in DC. When he and Glenn went on a run together, it seemed that Heath’s abilities at least matched, if not exceeded Glenn’s. It is most likely that we will see Rick utilize Heath as a scout at some point during the war. His ability to move quickly and unnoticed could prove invaluable to gathering information about Negan’s forces. Since his introduction Jesus has proved over and over again that he is one of the strongest characters in all of The Walking Dead lore. In his first appearance he was able to overpower both Michonne and Abraham. Little is known about Jesus’s life before the outbreak, but for whatever reason he is a master at hand to hand combat. While initially Rick distrusted him, Jesus quickly joined Rick’s inner circle, and Jesus has been a faithful soldier since, even going as far as helping in the plans of overthrowing Negan. Jesus will most likely be a power player in the conflict due to his deep connections in both the Kingdom and Hilltop, and his unparalleled fighting ability. Despite not being a soldier, Eugene is the member of Rick’s army that is poised to have the biggest effect on the war. Eugene has researched how to recycle spent bullet casings to make more bullets, and if the conflict is heavy enough and long enough, this ability could prove the difference in victory and defeat. If he can produce enough bullets to keep Rick’s army better armed than Negan’s he will have essentially won the war for the group. While I have not mentioned every member of Rick’s army that could play a role, I do believe that these five individuals will have the most impact during the course of the war. Even though Negan’s forces seem overwhelming, Rick has assembled a formidable army to face him. Two equally strong forces have never collided in The Walking Dead, and it looks like now that the moment is upon us, that it will be more exciting than any conflict before it.